It was getting a little scary there for a few days. 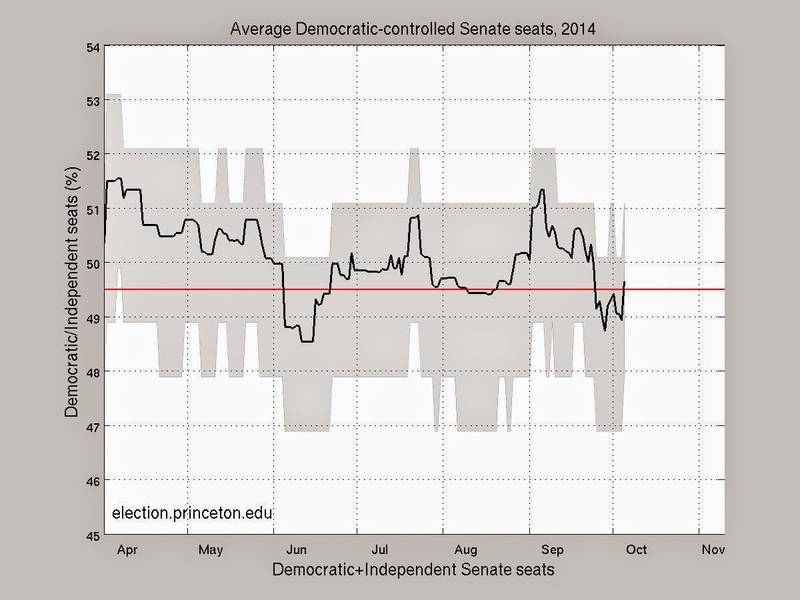 But Princeton Election Consortium has its polling prediction back with the Democrats plus the Independents for a win in the Senate to maintain control. Any traditional off-the-cuff prediction at this stage with a president polling such low numbers in popularity would have the opposing party with big wins in his last mid-terms. Well, it happened to George W.
Anyway, there's been a fascinating debate going about the predictive value of statistics and how to use them. I don't understand it, but my oldest boy does. He actually worked on a project like this with a Phd. Professor of Statistics at BYU that accurately predicted President Obama's first win in 2008. He even has a few issues with PEC's system (that I don't understand at all). But PEC got it right in 2012 too, much to the consternation of prognosticators like Bush's brain, Karl Rove. This is still razor thin because in this case, they are all talking about polling within a half of a percentage point. So, who knows? I'm just betting on T--- Blossom having another bad night.